esProc is a database computing script totally developed with Java. With esProc, you can use agile and ease-of-use syntax for interactive analysis of structured data. esProc is especially good at dealing with complex, flexible and occasional data computing. With JDBC package, esProc can be called by Java application as an embedded database, and then return the results to main program to further process and utilize. 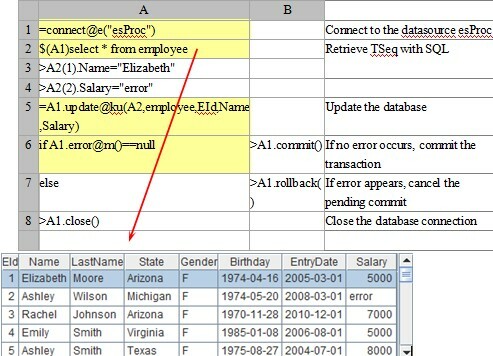 Its method of invoking conforms to the public JDBC specifications. The result will be returned in the form of stored procedures, just as same as a standard stored procedure. esProc can receive parameters before called, and return multiple results after called. Java is one of the most widely used programming languages. Pure Java product is easy for deployment and integration, and is completely platform-independent. esProc can be called directly in the Java environment with only one configuration file to complete the deployment. With its JDBC package, esProc can be called by Java application as an embedded database, and then return the results to that Java program for further process and utilization. Developers can get started quickly with the familiar Standard JDBC interface to call esProc calculation result, and don’t have to take a long time to understand the whole API. Java is good at programmable logic computing, but has not enough ability for structured data computing and analysis. It takes a lot of time and effort to finish the complex computations. esProc is very good at structured data computing and can greatly improve the development efficiency of complex data computing. esProc provides a simple JDBC package, which makes it easier for developers to freely access the database. With esProc, you can manage multi-source databases in different structure with a few concise statements. And the ResultSet returned from the database can automatically generate sequence tables, making it convenient for direct computing or presentation.